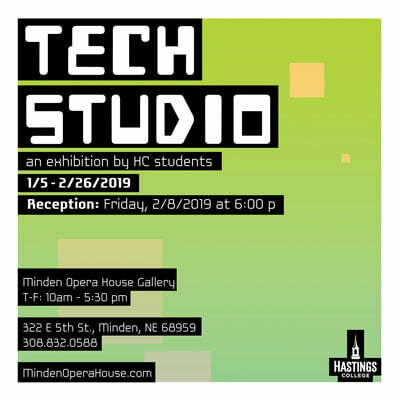 Tech Studio, which bridges tradition methods of creating art with digital processes of design and fabrication, is an exhibition at the Minden Opera House Gallery featuring work from Hastings College students. The Minden Opera House (322 E. 5th St. in Minden, Nebraska) will host an reception recognizing the work on February 8, at 6:00 p.m. The reception is free and open to the public. As part of Tech Studio, a course taught by Hastings College art instructor Kevin Mercer, students expound upon hand-drawn, handmade and found materials with 3D printing, laser cutting and scanning technologies. Theoretical, screen-bound shapes and forms are materialized in plastic, wood, paper, paint and more. The exhibit will be available until February 26 at the Minden Opera House, which is open from 10:00 a.m. to 5:30 p.m. Tuesday thru Friday.